My name is Marlen Gonzalez. I am 15 years old, a student at John Henry High School, and I am a RYOT (Richmond Youth Organizing Team) intern at RYSE. 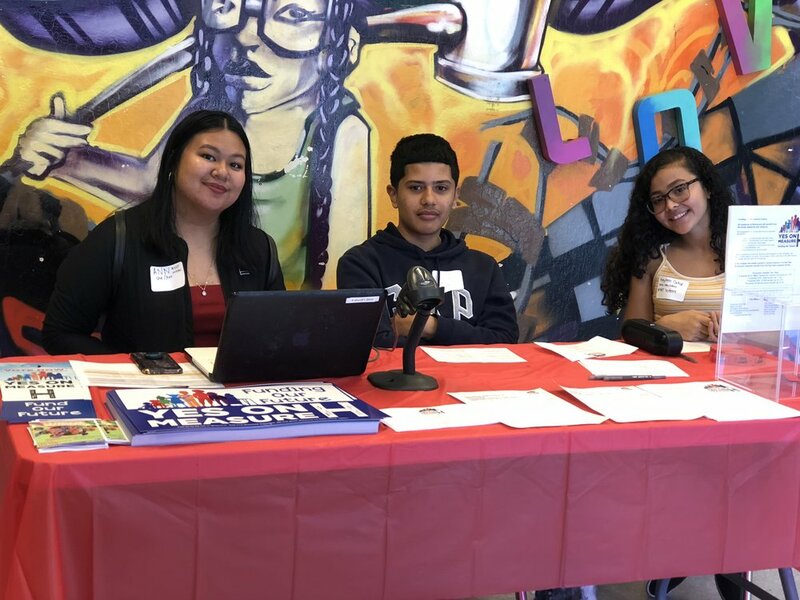 On September 14th, I supported RYSE at the 3rd annual La Feria de Septiembre event for our community to come together and learn about Chicanx, Latinx and Afro-Latinx history and heritage in a safe space where everyone is accepted. 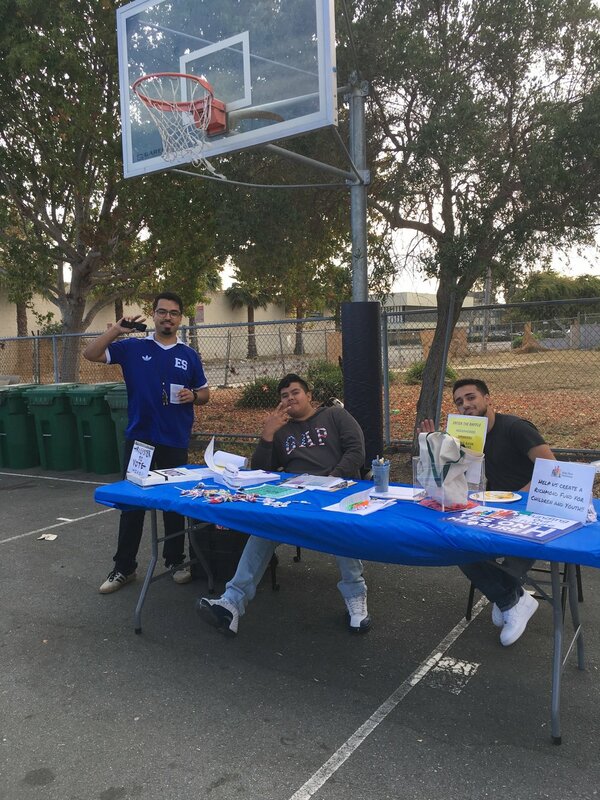 There were multiple activities available at the event for our community to enjoy. 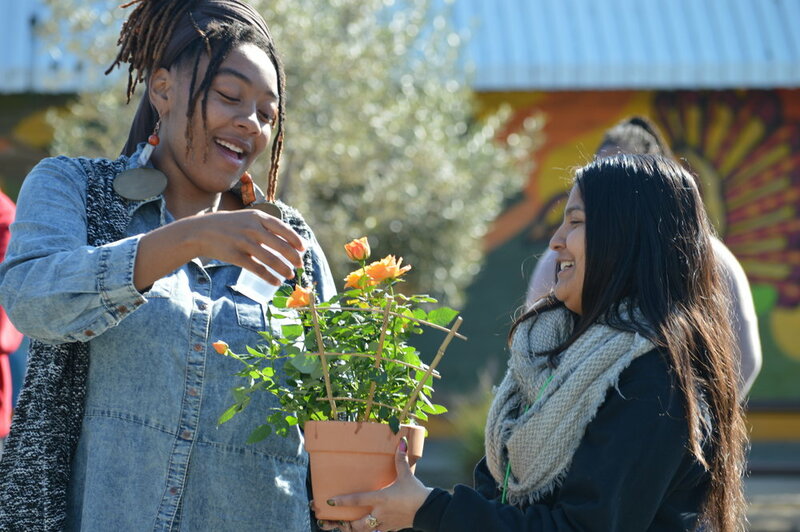 One activity was pot painting, where community members painted on flower pots what they thought growth meant to them, whether it was mental, physical, or emotional. 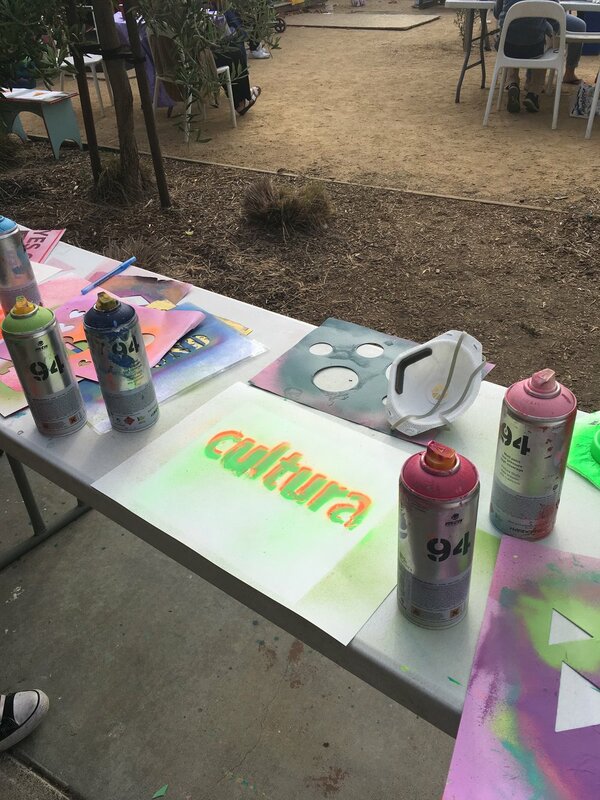 Another activity was stencil spraying where community members spray painted on stencils or made up their own thing- either way it was creative. The community also made flower crowns and flowers out of papel picado. 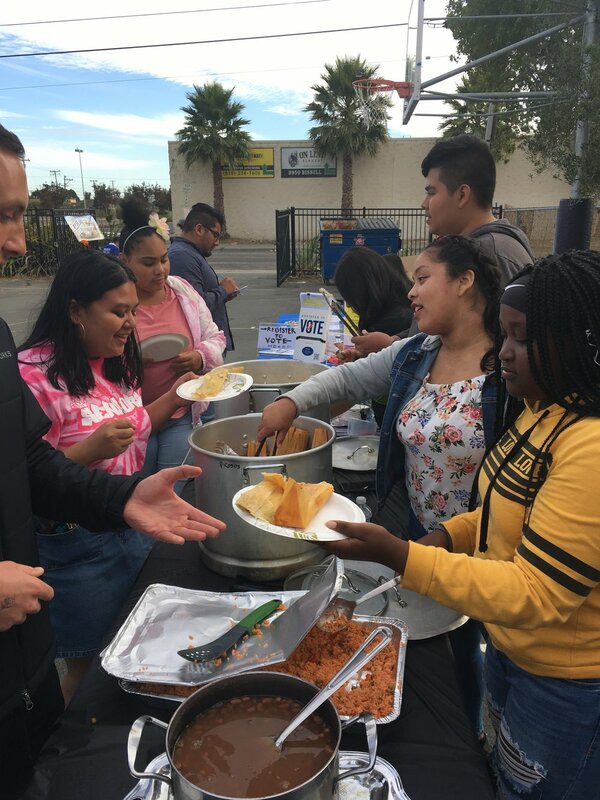 My role at the event was handing out the food and making sure people filled out a form about Chican@/Latin@ culture to which they were able to find the answers to in classrooms A and B. My favorite part was when people couldn't figure out which kind of tamale to get. 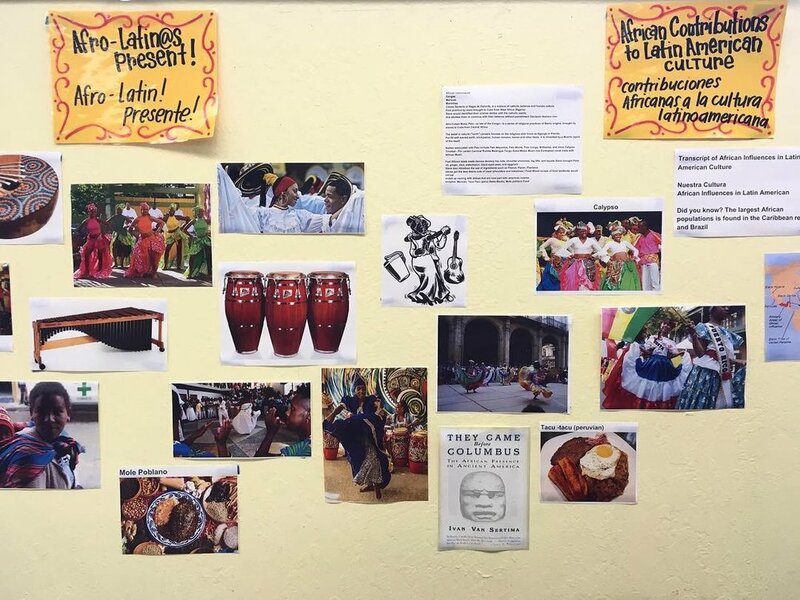 I believe our community gained more knowledge on Chican@/Latin@ culture. My favorite moment was when we all as a community joined together to watch the Aztec dancers dance their prayer. This was my favorite part of the event because I learned about what certain dances mean and how they pray to La Virgen de Guadalupe. As a RYOT intern, I support at events like these and programs to help educate my peers. I build and use community organizing skills to explore issues in our communities. One issue is that our youth don’t have enough resources to prepare ourselves for the real world after high school. The adults expect us to get ourselves to college, but with what money? Why do they set standards that only certain people can reach? 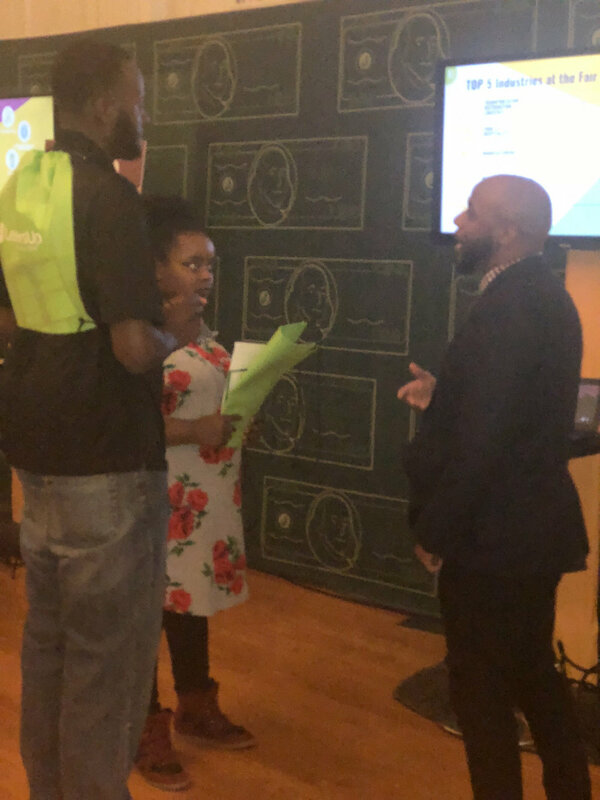 Don’t misunderstand me by “standards that only certain people can reach.” I don’t mean that students don’t have the mentality to meet the standard… NO…. I mean that we don't have the money and resources. No student left behind means that every child and youth should be able to pursue their educational goals including the ones set for college and not just from elementary school to high school. Please support our youth as they lead. 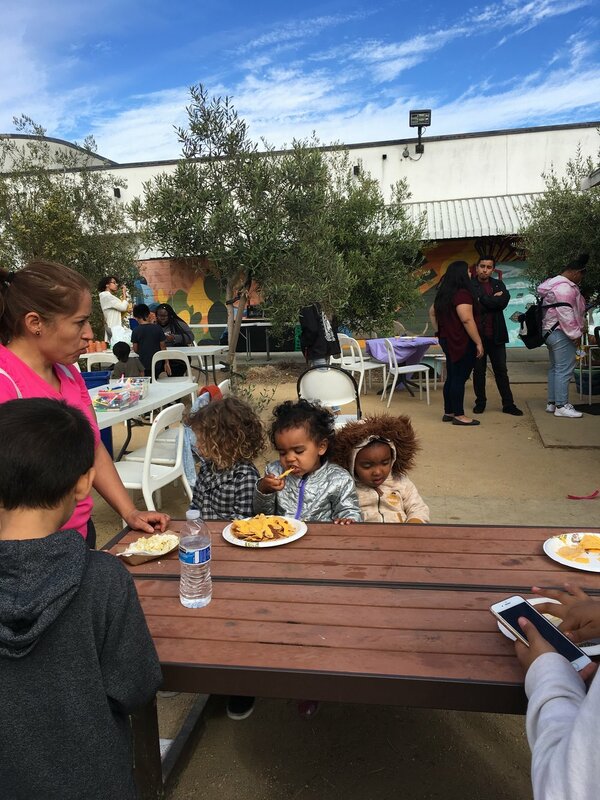 Check out photos from our La Feria de Septiembre event! This month, RYSE also held workshops for Banned Books Week, organized a field trip for members to the #OpportunityStartsHere Hiring Fair, helped launch a collaborative art project with Richmond Art Center, and kicked off the campaign for Measures E & H.
RYSE members learn about the history of banned books and make their own zines during one of our workshops for Banned Books Week. 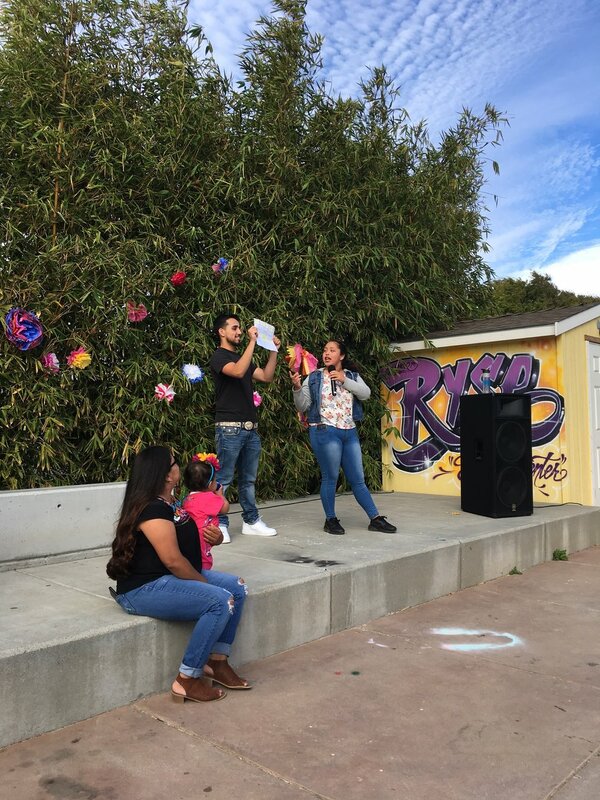 RYSE members discuss their right to read, write, learn/unlearn and speak about their fears, trauma, joy, oppression, resistance, and rights. RYSE members participate in an activity on identity called "My liberation is bound up with yours." Shoutout to Aja on her First Poem Publication! RYSE Music & Performing Arts Coordinator Aja Lenae Johnson’s poem is featured in Counternarratives from Women of Color Academics! 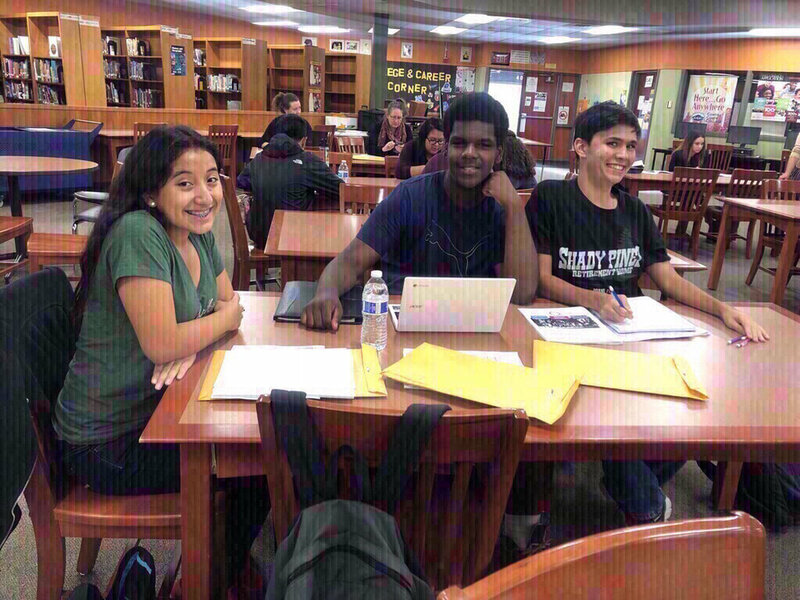 DLCAP interns hard at work at Kennedy High for a work session. 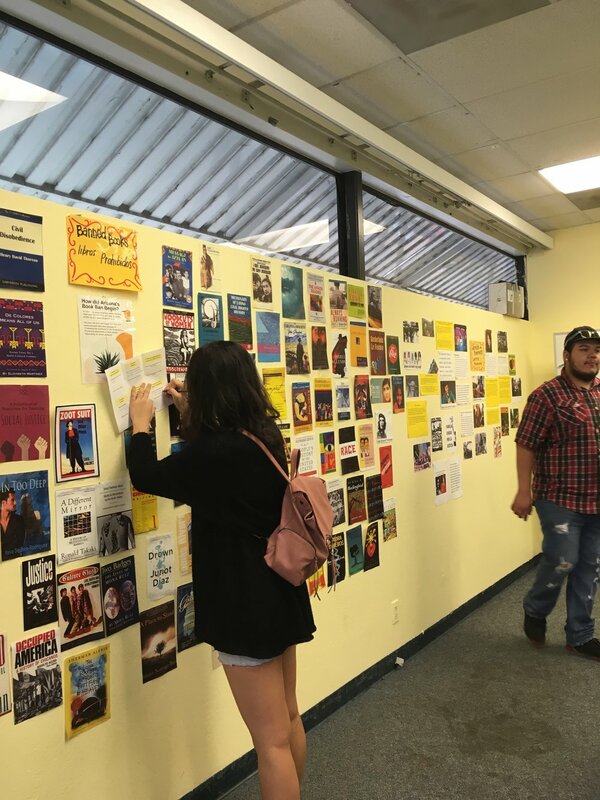 RYSE Visual Arts Coordinator Agana will be leading a Community Mural class in collaboration, where RYSE members will explore the theme of borders, how they show up in our lives, and what it means to move freely. For the next two months, members will be creating a community mural at RAC, which will premiere this November. Next month marks 10 Years of RYSE. Celebrate with us. We’re celebrating our 10 year anniversary all through the month of October, with events including an open house, movie night, spa day, and more. View our entire calendar of events here. We close out the month with a Club Night featuring dancing, music, food, drinks, and fun! Tickets start at only $10. Give RYSE a birthday gift! Donate to our anniversary giving campaign this month. Thank you gifts include limited run commemorative posters, t-shirts, and enamel pins. Thank you, Yale Class of 1993, for leading this fundraiser for our annual winter event, Full of Cheer: A “Feed the Family” Gathering. Help us reach our goal of $8,670 to purchase 400 high quality hoodies and 200 beanies to provide to families!